My New Commuter Life, Part II: Just Because I Now Live in Florida…. ….doesn’t mean I never have to see snow again, right? Or drive in the snow again? On last weekend’s trip to Omaha, I was fortunate to travel in between major winter weather systems. Temperatures were in the 50s on my first day there, quite nice! We were forecasting 1-2″ of snow on Thursday, February 24th. We told EVERYONE 1-2″, and not just us: the National Weather Service, the television stations, everyone! You know how folks talk about great things (or not-so-great things) that happen when “all the stars are aligned?” Well, in this case, several things “aligned” in the atmosphere to make this nearly-horizontal dark green line form across central Nebraska. I’m not going to get into the wintertime “convective symmetric instability” here. That line is HEAVY SNOW, and it dumped about 5″ of snow in 3 hours in Bellevue and in areas just south of Offutt AFB. And the line barely moved for those 3 hours. It was NUTS! And I got to drive home in it. Whee! I had reported for duty very early that morning, so I figured I’d be heading home around 1:00-1:30pm, but at the last minute I had a meeting that took me to about 3:00pm. The movement of this line was very slow, and I was itching to leave for the day, so after a few minutes of monitoring a non-moving line, I bit the bullet and left. If I had left when I thought I’d be leaving, I’d have made it back to where I was staying without incident. Instead, I fishtailed and skidded all the way back, with heavy snow making things all the worse. I ending up coming back into my old neighborhood right as my boys’ former elementary school was letting out. The neighborhood is hilly, and there were cars slipping and sliding everywhere. Since only 1-2″ of snow was originally forecast, the salt/silt trucks didn’t even come out to prepare the roads. What a horrific mess! I couldn’t get that #$% Mustang up the last hill before getting to the house. I tried several times, but it just wasn’t happening. If there wasn’t so much after-school traffic, I might have had the room to roll backwards down the hill, and get enough speed to do it. But I simply had to abandon the car about a block from where I was staying, and walk in the heavy snowfall, and on unshoveled sidewalks, to the house. I had my full winter-weather gear, and nice warm boots, at least. It wasn’t a long walk. Uphill, of course. About 1/2 hour later, my hostess loaded a few supplies into her Suburban and drove me back over to the car. With less traffic, I was able to roll backwards back down the hill and tear with full power up the hill to the house. And here it is right after I got it parked — POINTING DOWNHILL on the legal side of the street. How incredibly frustrating — I’m not a bad winter-weather driver. I could hold my own in places like Pennsylvania, Ohio and South Korea. Even our 2 1/2 years in Nebraska, we were fine even driving our Toyota Prius. But with this Mustang, I was dealing with a very lightweight, rear-wheel drive vehicle. Ugh! The local National Weather Service office had put out this map of snowfall totals from that one event, note how there was 5+” of snow in a narrow ribbon across south-central eastern Nebraska, but NONE in northern Sarpy and Douglas Counties. Downtown Omaha saw no snow, but 10 miles to the south was buried in 5-6″ of snow that fell in just 3-4 hours. There were cold temperatures and snow showers for the next couple days of my stay in the Omaha area, and the snowy weather turned into a freezing rain risk that lasted right up until just a couple hours before my flight out on the 27th. Since I was heading into work each day at about 4:45am, luckily I could slip and slide around without other cars in the way. It was nerve-wracking, but I survived. Next up, Part III: a happier post about my fun times on this trip: trying out Ethiopian food, enjoying Pokeno with the girls, and shopping at my favorite store, Trader Joe’s! Not sure if this picture is from that exact ice storm, but this is a good example of what Southwestern LA looked like after this storm. 2.) Seoul, S. Korea. Monsoon flooding, August 1998. (<– See 5th paragraph of this link) We had a Korean citizen working in our weather unit. Mr. Ko. He told us that folklore said that every 11 years, the annual Korea Monsoon is worse than usual. And every 11th of those 11 years, it’s even worse. And 1998 was predicted to be that 121st year. All of us Americans who’d heard this were like, “Yeah, right, whatever…” Well, the folklore was right. It was the worst flooding in everyone’s memory, bridges that bisected Seoul were flooded out, the military was on the verge of deploying thousands of people into the fields for a major exercise and those plans were disrupted. The building Dave and I lived in flooded on the ground floor, and our Saturn flooded a little, too. But we didn’t have it nearly as badly as some of those stationed closer to the DMZ, whose quonset huts filled to the brim! 3.) Beavercreek (Dayton), OH. Xenia Tornado Redux, September 20, 2000. We moved to Florida in spring 2002. As the hurricane seasons of 2002 and 2003 wound down, we started looking at just how long it had been since a hurricane hit the Florida east coast south of Jacksonville and north of where Hurricane Andrew had hit in 1992. Nearly 100 years, if I remember correctly! As every year since Andrew had passed, Florida was holding its breath for the next “biggie”. The EQ Industries Chlorine Storage Facility Fire occurred about 1/2 mile from our house. We could see the glow of the flames from our front porch. 6.) Bellevue (Omaha), NE. The winter of 2009-2010 certainly packed a punch! Dave shoveling a path for the dog in the backyard Christmas morning. Starting with a Columbus Day-weekend snow event! On October 9-10, 2009, the Omaha Metro area received 3-5″ of snow! The family was planning to go test-driving new vehicles that weekend, and we were pleased that the snow had mostly melted by the evening of the 10th. But still! After a reprise through about Thanksgiving, December proved to be almost-recording setting, with over 20″ during the month of December alone. The kids had their first snow days on December 9th and 10th, and then when the family was returning from Walt Disney World on December 24th, a major winter storm was taking shape that shut down Dallas-Fort Worth airport just after our flight took off (phew) and we were so proud of the crews at Omaha Eppley Airfield for working so hard on keeping the runways cleared. It was rather scary driving home from the airport in the high winds and blowing snow! This photo album shows some of the weather we had dealt with during that blizzard. We had several other snow events, with the kids having some 6 snow days this year and several records being broken, mostly related to how long the area had a snowpack (approximately December 19, 2009 to approximately March 23, 2010). But not the absolute snowiest winter in Omaha. Some pretty crazy side effects of all this snow emerged, too. Enjoy stories of school districts getting in trouble for not schooling their kids enough, and snowmelt revealing mold on lawns. Rime Ice or Hoar Frost? Calling all Frost Experts! Greetings from Norway, I mean, Nebraska! 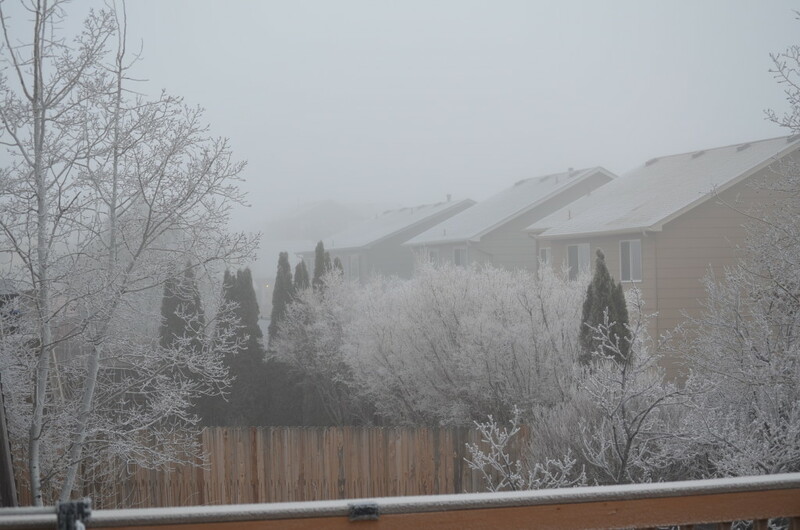 On Thursday night, after a couple days of melting ice and cold nights, and after a weak cold front moved through, saturated air near the surface brought foggy conditions to our neighborhood. 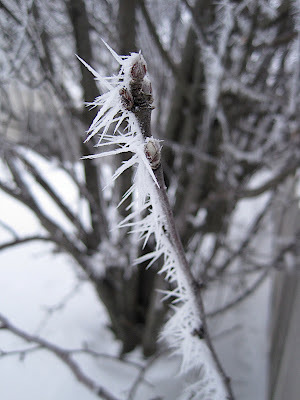 On Friday morning, I saw our trees covered in heavy frost. From 2010 01 15 Rime Ice or Hoar Frost? …I noticed the ice was forming into long needles, all oriented in one direction. I had to trudge through knee-deep drifts that we still had in our front yard to get these pictures, but they’re definitely worth it. The temperature range was right for rime ice, as were the saturation conditions and winds, which drive the direction of ice formation. But Dave told me there were discussions as to whether this was a phenomena called “hoar frost”. No, not “whore frost”. I don’t even want to go there. 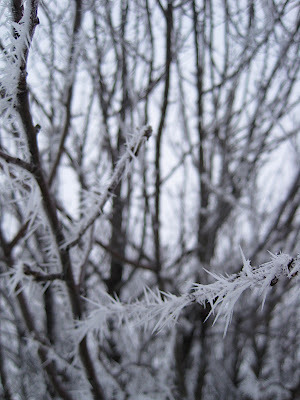 Might this be “hoarfrost” or “hoar frost”, which is also mentioned in that Wikipedia link above? When hoar frost conditions have a slight breeze they can orient their formation in one particular direction. But according to the definition and pictures here, I’m less inclined to think so. I think what we have is actually “soft rime”. What I saw and experienced fit all of these definitions, the thin, milky white needles, and the ease with which is fell off the trees in the slightest breeze. The winds were from a northerly direction Thursday night, if there was a wind at all. So according to the definition, the needles should be pointing towards the north, and indeed they were. UPDATE: On Saturday morning, the same conditions turned out even heavier rime, and I just took a few pictures and will add them momentarily. 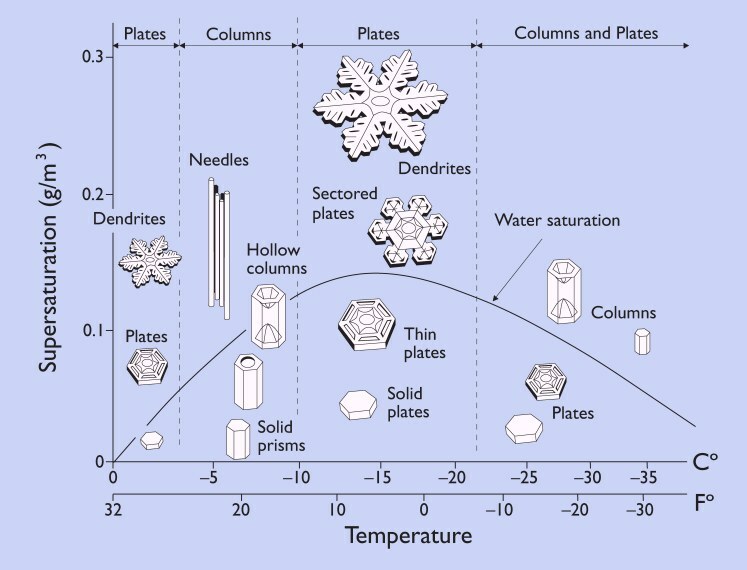 A billion years ago, in one of my meteorology classes, I was taught the temperature ranges at which snowflakes will form their different potential shapes. I remember getting tested on the information, too. Heck if I know now, but I can now find out with the click of a button…. Anyway, here are some pictures I took today from when the temperature was around 0F, and these are some of the prettiest dendrites I’ve seen with my own eyes (rather than in a book). I’m posting these pics nice and large so you can see the elaborate detail. Isn’t science beautiful? Now that I’m home, I’m slowly getting back to normal. One of the things that was on my mind while I was away was setting up one of our webcams (that we used to keep in touch during my deployment) as a weather webcam, that connects to our home weather station. So here you go. Have some fun and scroll down on the webcam page to the calendar and select “View Video” to see a daily 24-hour loop. This will look better in 2-3 days when we have some steady-state views. I’ve been adjusting the timestamp, viewing angle and resolution so it isn’t perfect at the moment. You can also look to the right and see the new, improved weather sticker for our weather station. The weather observation is from our backyard, while the webcam is pointing out our front window, aimed towards the north-northwest. It’s supposed to auto-update about once a minute. The kids (and that means Dave too) were enjoying their first “workable” snow of the season. What does “workable” mean? It means snow angels that didn’t blow away, plus snowmen and snow forts! …More Nebraska weather fun. A cold front came through and plummeted our temperature from 53F at 9pm to 32F at 11pm. …snow forecast tomorrow and tomorrow night again…highs in the 20s…. We awakened this morning to about an inch of snow here. Yay! I leave tomorrow for Florida for my pre-deployment training and I was hoping to see some snow before I left. We had the boys bundled up and out the door around 8am. That’s Jacob throwing snow at Howie on the left. Timmy in the center with the back of his hood covered in snow. Howie probably had the most fun of all, he was running in circles and enjoying rolling around in the snow. What’s super cool? This snow won’t melt by lunchtime, the way it usually does in Raleigh. It’s friggin’ cold here. Highs in the 30s, lows in the 20s…winds 15-20 knots, gusting into the 30s. It’s been like this since Thursday. It’s going to be like this for a while. Okay okay okay…I’m a wuss. I grew up on the coast. When you live near water, cold temperature spells are pretty short-lived. Even in the coldest part of winter, your below-freezing spells are only 48 hours or so. I went to college in central Pennsylvania, and that was my first time in my memory spending a long time in cold weather. And I didn’t hear the end of it about what a wuss I was from the native Pennsylvanians and New Englanders who were used to blizzard conditions and weeks-at-a-time of overcast skies. And in the 14 years since college, only 3 1/2 of those years were spent in cold climates: Seoul, Korea and Dayton, Ohio. The rest of the time was in the sunny South. Until now. So here we are in Nebraska. Cold. Long range forecasts are telling of the true arrival of winter. I brought in my plants, noticed all those little black bugs that crawled through my window screens are no longer and it’s time to bring in the porch furniture. Organized the hats, scarves, mittens, gloves, balaclavas and snow pants in our makeshift “mudroom”. So we’re ready for the snow. If it’s going ot be this cold, at least make it fun with some snow. PS: I love Calvin and Hobbes, especially the snow-related cartoons. I found this site which has a bunch (but not all) of the snow-series.